One of the internet’s most important qualities is that it slashes transaction costs to a bare minimum. What has followed is a remarkable development: It is becoming cost-effective, even profitable, to serve the world’s poorest two billion people—whether they are online or not. Entrepreneurs are devising new services to provide neighborhood-scale renewable energy and clean water, gas cooking-stoves, microloans for consumer goods and insurance against natural disasters. The enablers are mobile money, the internet of things, data science, even satellite imaging—all now remarkably cheaper and more accessible. One thing that isn’t necessarily required: a smartphone. While the narrative from U.S. tech giants like Google and Facebook implies that economic development comes from directly connecting people to the internet, billions of people can’t afford smartphones, and many might never get them. Innovators must think around that barrier.The global poor often pay more per unit for what they consume, be it energy, consumer goods or bandwidth, precisely because they can’t afford to buy these things in the volumes that wealthier people do. They also appear to be credit risks, because they’re short on assets. “When microfinance appeared a few years ago, the big innovation was to be able to offer a loan to a person who had no credit history,” says Xavier Faz, head of business model innovation at the Consultative Group to Assist the Poor, part of the World Bank. Now, there is “a very wide variety of lending models which leverage alternative information to assess risk,” he says. These services are still nascent, reaching tens of thousands of households out of a potential market of hundreds of millions. And as rich countries have discovered, connecting everyone has its downsides, as the networks that underlie communications and finance create new vulnerabilities for nations and individuals. But it’s also true that using the internet to access basic services can significantly boost the fortunes of the world’s poorest people. 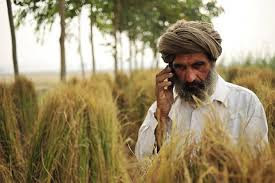 For WorldCover, which offers low-cost crop insurance to farmers in rural Africa, most customers “can’t even type a number into a feature phone,” says Chief Executive Christopher Sheehan. (A feature phone is any cellphone without a touch screen, the same kind we all used to rely on before the iPhone and which still constitutes the majority of phones in the poorest parts of the developing world.) For farmers who don’t have irrigation, much less a smartphone, getting access to crop insurance is a potential life-saver. WorldCover charges a few dollars (prices vary) to insure, say, a bag of harvested maize in Ghana worth around $25, Mr. Sheehan says. If there’s a drought, the farmer gets between 50% and 100% of the bag’s value, depending on the severity. The company sends salespeople into rural villages to explain the service. Afterward, it connects with its customers via a handful of people in the village who have simple feature phones and some ability to read. When possible, mobile money services such as M-Pesa are used to collect premiums and make payouts. Because M-Pesa was born on feature phones, citizens of many countries in Africa can access mobile wallets without a smartphone. And those who lack even a feature phone can get payouts in cash directly from WorldCover. WorldCover raises money from institutional investors who are used to “catastrophe bond” returns of 5% to 7%. It charges farmers enough to get an additional margin on top of that. Eventually, WorldCover hopes to have its portfolio underwritten not only by institutional investors but also by retail investors. It’s a model similar to LendingClub . Because WorldCover is taking money from investors, it’s passing on the risk of a big drought hitting its entire portfolio to those investors, who in theory are happy to take on the risk as long as it’s part of a larger diversified portfolio. After Reeza Zarook cashed out of Anything.lk, Sri Lanka’s first-ever e-commerce company, he decided to tackle a big concern: 40% of the population couldn’t buy from his company. They were so poor, traditional banks wouldn’t extend them any credit. Mr. Zarook wanted to help poor people buy consumer goods they need—a smartphone, a computer, a gas stove—which typical microfinance loans don’t cover. In late 2014, he launched Rukula, which enables vendors of pretty much any type of consumer good to sell it to customers on credit. A Rukula staffer in a call center evaluates, over the phone, potential customers’ creditworthiness in three-to-four minute interviews. Rukula charges 40% interest on a six-month loan. This might sound usurious, but it’s typical for microloans, which have relatively higher service costs than loans available in rich countries. The firm doesn’t take collateral, and it caps the interest: A customer will never pay more than $140 back for a $100 loan, no matter how long that takes. On average, loans are paid back in 15 months, and 95% of the company’s loans have been paid off by the two-year mark. The company turned a profit within two years. People in the world’s informal settlements (aka shantytowns) burn solid fuel such as charcoal, wood—even dung. It’s the deadliest environmental problem on Earth, the World Health Organization says, killing between 3.5 million and 4.3 million people a year. Cooking with gas is cleaner and more convenient, but it’s hard to pay $50 for a canister and $10 for refills when you live on less than $5 a day, says Nick Quintong, chief executive of PayGo Energy, based in Nairobi, Kenya. PayGo’s solution is an internet-connected canister that meters very small amounts of gas, automatically charging customers through the mobile money system M-Pesa. While someone in the household needs access to a phone, the service doesn’t require users to be online: PayGo canisters have their own cellular connections. Businesses like these face huge hurdles, beyond what normal tech startups contend with. “In the fintech space in many countries, there is a high rate of failure, and that failure can happen for many reasons,” Mr. Faz says. Catalyst Fund, supported by the Gates Foundation and JPMorgan Chase , doles out $100,000 grants—not investments—to companies including PayGo. The fund pays in two installments, at the beginning and end of its engagement. That doesn’t mean these companies are charities, however—all three have received investment from venture capital and other more traditional sources. There are risks associated with connecting poor people to broader networks that can be instruments of control as well as of liberation. But despite the threat of some new form of colonialism, research on microfinance has shown again and again that getting credit to people who would otherwise have none does transform lives.